Most of his life, Wichitan Keith Lewallen did not know what happened the morning of March 25, 1944, when his brother Don disappeared. That changed in 2000, when he heard that his brother's aircraft, Bomber 31, had been discovered in a remote spot on the Russian peninsula of Kamchatka. 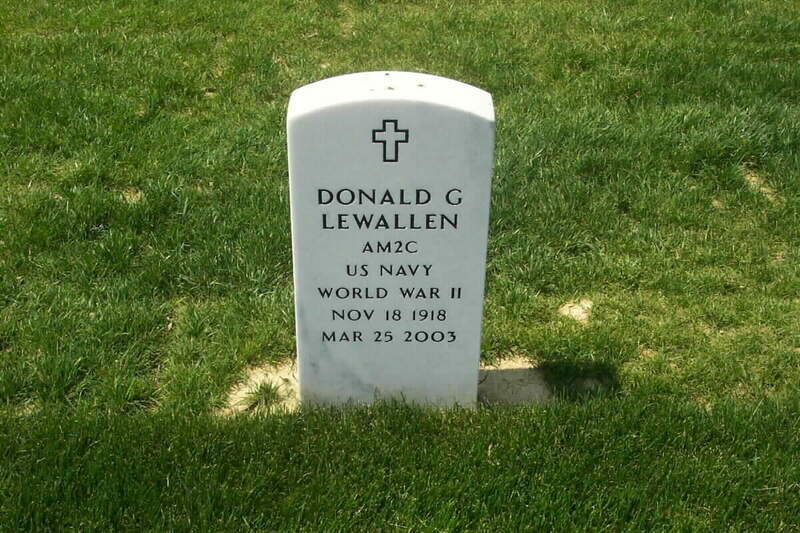 The family was finally able to put Don's remains to rest at Arlington National Cemetery in November. Since then, Lewallen has done several interviews that he says have allowed him to honor Don and his squadron by preserving their story and legacy. "I don't need the publicity," he said. "I just want people to know what they did was important." The story begins almost 60 years ago. Lewallen was only six but he vividly remembers the day his father told him his brother was missing in action. Lewallen had always assumed that his brother's plane had plunged into the Pacific. It wasn't until the government said the plane had been found that he began doing research on his brother's last flight. From details in articles after the plane was discovered, "I started to learn what had happened," he said. Don, an Omaha native, was last seen alive when he and seven other men left for the Kurile Islands of Japan on a mission from which they would never return. He was a navigator on Bomber 31 and was part of the 139 Ventura Bombing Squadron, which was stationed on the Attun Island of Alaska Territory. The plane made a crash landing on the Kamchatka Peninsula on Russia's east coast. Lewallen started to get a more personal understanding of his brother's experiences when squadron and family reunions were combined in Wichita in June 2002. "There were men there that knew about the mission mostly because the plane had disappeared," he said. "The experience was wonderful." Today. Keith is in his sixties and Don is still his hero. "I was proud of him," he said, donning a pin with the VBS 139's insignia -- a bee holding one bomb and throwing another while gripping a cigar in its mouth. One of the squadron members had given it to him at a reunion. "I wear it to honor my brother and his crew mates," he said. "It pays tribute to those men." He still keeps in touch with a few of the squadron members. Some are like family to him. "The men are incredible," he said, "not because they knew my brother, but because of the people they are." Lewallen said he also respects the men of VBS 139. "Men of that time don't go off sounding their own horn," he said. "They say it was their duty and nothing more. They aren't seeking recognition. I just hope a little comes their way." Lewallen said the discovery of Bomber 31 has created more memories to add to the few personal ones he has of his brother. He pulled a button out of his pocket. It held a picture of his brother, at age 25, in his Navy dress uniform. Lewallen's family wears the buttons on special occasions. They wore them at the reunion and at the services at Arlington. Lewallen said the mystery behind his brother's death is not entirely resolved. "I don't have closure; there never will be any," he said. "There are still questions to be answered. I still don't know how he died." But he said he is grateful for what he has learned. He quoted the Navy chaplain who performed the ceremony: "'In life they honored the flag; in death the flag honored them,' " he said. "That's what this is all about," Lewallen said, "that they, Don and the other men, be honored is my primary concern."